6'8" 250# Charles Thomas is a thumper 9th man who might see the court for a minute or 2. No real way to sugar coat how big of a loss that Isaac Copeland is. We're talking about a guy who was shooting 53% on his jump shot 2s as our official zone buster and was defending/blocking shots without fouling. Given how Nebraska has been playing it might seem to be impossible for Nebraska to win any more games but on the other hand what if Nebraska simply (or not so simply) starts playing better? Lots of Jimmys and Joes on this team that now finds itself in a very familiar role of underdog. If this is a team that was suffering under the weight of expectations, what happens when that weight gets lifted? Are we looking at a big pivot here? I think for the last month or so we've been struggling as a team as we fancy ourselves as a team capable of running someone out of the gym as opposed to winning by generating stops. Is this a pivot to a slower, defensive team? With our lack of size is it a pivot to an even more small ball team? Given our lack of bench production and past history, 'defensive grinder' seems like the big move if there is to be a big move. How will we replace the scoring of Copeland? Let's look at how much starters were shooting in conference. As you might expect, Palmer analytically is our go to guy. 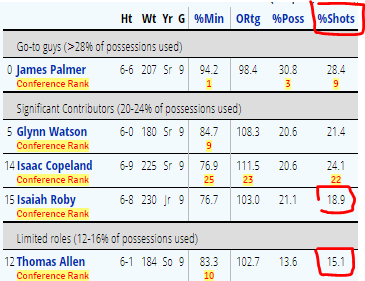 What you can also see is that Roby and Allen don't shoot as much as the rest of the starters and the talent is there for them to take on more of a scoring role. It's either that or else Watson and Palmer are REALLY going to start shooting. Defensively, Nebraska will have to work tonight because Wisconsin will patiently work the shot clock swinging the ball around to find a look and if that doesn't happen you're getting a 3 ball from someone that will be devastating when it goes in. No doubt Happ will be the focus and can Tanner guard him without fouling out in 15 minutes? Things could get very dicey tonight. Offensively you're not going to get those fast break points against this defense because they're going to bail after every shot to stop transition. How well do you think Nebraska can shoot tonight because shooting well from 3 has been the common denominator for most of Wisconsin's loses. Can Nebraska drive enough to get those good looks? Can Palmer get back to the line? He's had success in the past. Is Nebraska going to come out with the swagger they've had at points this season? If so they have a great chance to win this game. If not, this Wisconsin team will hold them under 60. These guys aren't waving the white flag just yet. The 1 way this works is roby going to the 4 finally makes him the player we always thought he should be. Tanner and Brady’s more inside games help to space the floor better on offense. Somehow tanner and Brady make up for our previous rebounding woes. And we start taking all the open threes we get and hopefully hitting a third of them.